Starting with fragrance and this Jo Loves Grapefruit Body Spray was a birthday present from my friend and a wonderful introduction to the Jo Loves range. I'm in love! 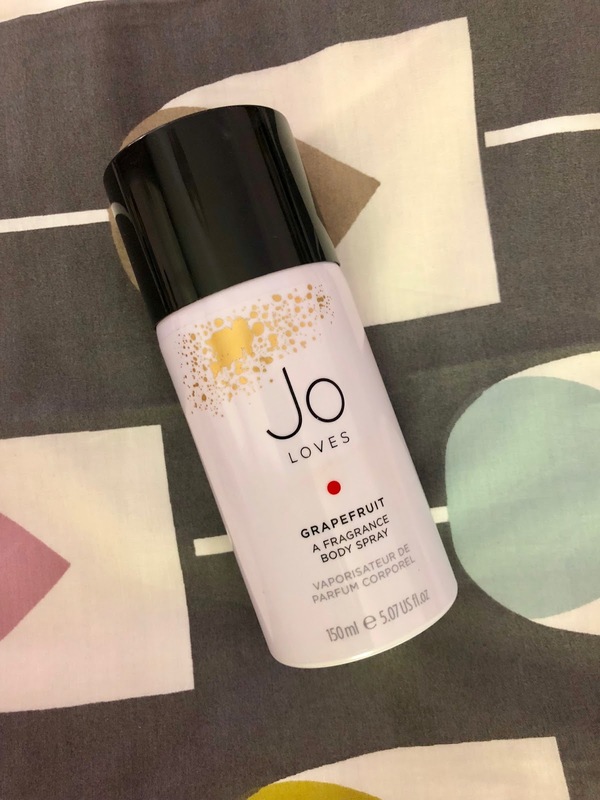 I like but don't love the Jo Malone Grapefruit fragrance but I adore this - it's a little more sophisticated and complex and it's one of the first perfumes I've worn in ages that people have commented on. I wonder too if that's to do with the body spray format? It's a lovely all-over but subtle way to use fragrance and I still get little wafts of it even later in the day. Another fragrance I'm loving at the moment is the Dermot O'Leary aftershave in Marks & Spencer. 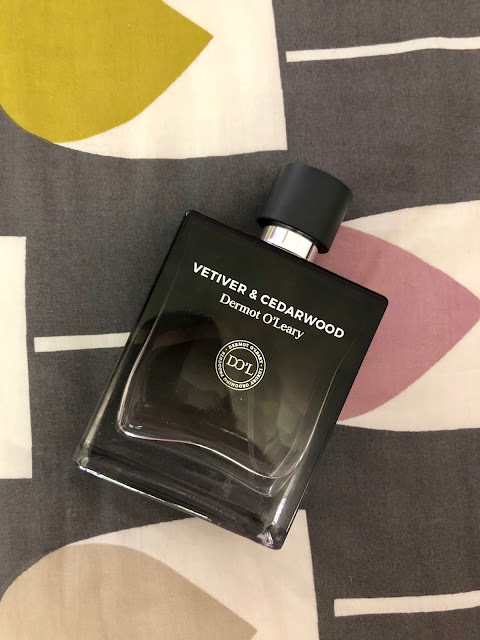 I'm a sucker for anything with vetiver in it so the Vetiver & Cedarwood is my favourite - it reminds me of one of the Tom Ford fragrances actually. I've really enjoyed alternating this one with the Jo Loves. It's unfortunately sold out online but if you see any in-store do give it a try. Only £22 I think? Moving onto skincare and Clarins sent me a travel size of their Day Screen Multi-Protecton lotion to try and I'm very impressed. It's a fragrance free, oil free, UVA & UVB translucent sun cream for the face that can be patted on over make-up or worn alone. It's a big hit with the kids as well as with me as it doesn't irritate the eyes and the whiteness disappears quickly. 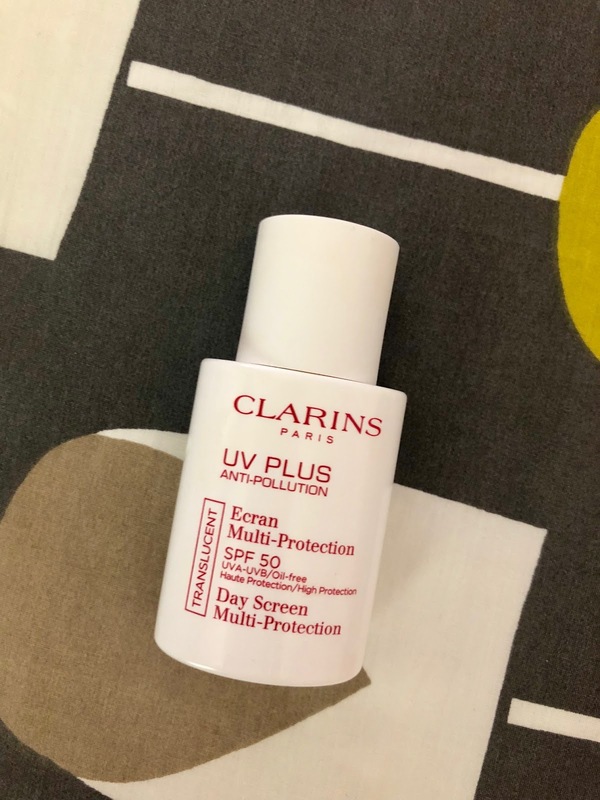 I always wear my Epionce tinted SPF 50 every day but this Clarins product is perfect for adding during the day to extend the protection in this hot weather. She had been telling me how much she loves this lightly fragranced, easily absorbed body cream and I now know why she rates it so highly. It's a clean, unassuming scent that won't conflict with your perfume, it absorbs really fast and leaves your skin so soft to the touch. It comes in the most beautiful bottle too, which is a nice bonus! 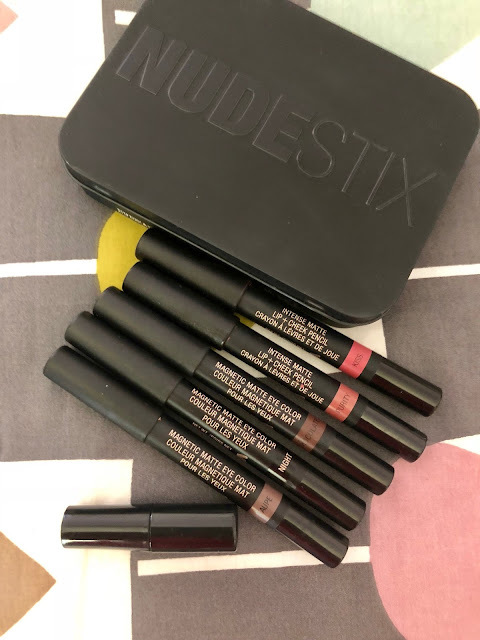 Finishing with make up and I've been road testing these Nudestix for the past 2 weeks. 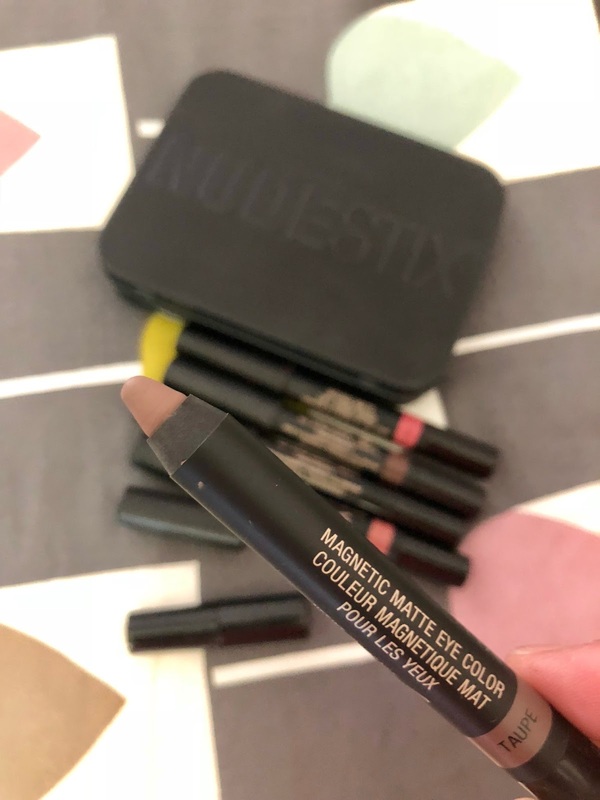 I'd never heard of the brand until I was sent these as a PR gift but they're basically a kind of chubby pencil product with gorgeous pigmentation that glides onto the skin so beautifully. My favourite are the eye ones which allow you to create an effortless smokey eye, especially the black one which is amazing for tight-lining. I'm linking here to an offer on QVC for 3 of the eye ones or 3 lip/cheek ones. Each priced at only £15.98! They're smaller than the ones I got but a great opportunity to try them out if you're interested. They can be bought individually for £20 or in sets of 6 for £60 and if you're near London, there's a pop up during the month of July in Harvey Nichols where you can create your own bespoke box of 6 - the sets sold online have fixed colours in them usually. Hi Avril. 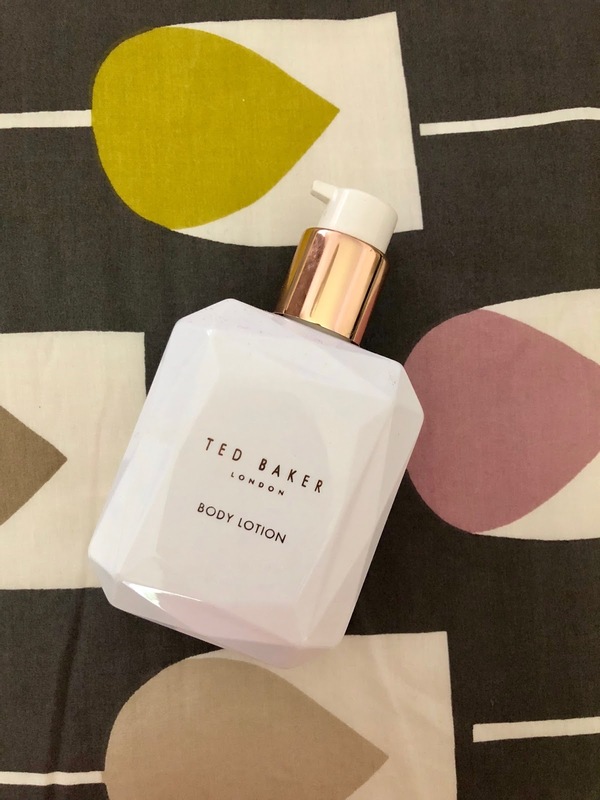 The Ted Baker sounds interesting! If you had to compare it to another fragrance what would say it was like?? Thanks ! !